Spend 48 hours in Athens and you can experience some truly fascinating history; ancient architecture and archaeology; spectacular views; magical, scented pine woods. Or you can dine out in style; shop for the latest contemporary design; see cutting-edge art exhibits and dance the night away at a techno rave. You don't actually have to choose. In this lively, sophisticated Mediterranean city, ancient and modern coexist, happily inseparable. People-watch in a café and you'll recognize the faces of the statues and frescoes in Athens' museums; in the markets and bars, you'll overhear the lively discussions that might once have rung out across the ancient agora. They say that if you dig a hole anywhere in Athens, you'll discover archaeology. And that's been proven at almost every Metro station built for the Athens Olympics in 2009. There, in large glass-fronted mini museums or embedded in the walls, are all the ancient artifacts found at that location. 'AthenWas, a 27-room luxury design boutique hotel opened in 2015, is within yards of the Acropolis and the Acropolis Museum. Every room has a shady terrace. O&B Athens Boutique Hotel has a modern, minimalist vibe and is midway between the Acropolis and the nightlife district of Gazi - a 15-minute walk to each. 12 noon: Ease yourself into Athens rhythms with a traditional lunch on the terrace of Gods Restaurant, just across from the Acropolis Museum. This family-owned restaurant is in a prime location on pedestrian Makriyianni Street. It may be on the tourist trail but it has loads of fans — including the locals — and it puts you in the perfect spot for the rest of the afternoon without having to worry about travel arrangements. They set out their daily specials in glass cases, but if you've just arrived in Greece, steer clear of the food on display and go for freshly grilled fish, souvlaki, gyro or kebab and a Greek salad. 1:30 p.m.: Watch an artisan craftsman shape 24K gold into classically inspired jewelry, using methods that have changed very little in millennia, at the Ilias Lalaounis Jewelry Museum. Lalaounis, who died in 2013, was an internationally acclaimed goldsmith and sculptor in precious metals. He was to Athens what Tiffany was to New York, Cartier to Paris, Bulgari to Rome. His work, inspired by ancient art and historic finds, was worn by celebrities, presented to kings and even appeared in films. The museum, housed in his former workshop, is now run as a non-profit cultural and education institution. Its exhibits include 3,000 items from 50 collections as well as temporary exhibitions from all over the world. There's a model workshop on the ground floor where a jeweler makes small items and demonstrates ancient techniques. 3:15 p.m.: When workers began to excavate the foundations of the Acropolis Museum, they discovered an unknown Byzantine street and a complete street of domestic houses from the classical period. Rather than excavate the archaeology and then bury the ancient site in the foundations of the new building, they designed the museum to float above it on pillars. After entering across the excavations on a flying bridge, visitors may be slightly unnerved to find themselves on a glass "ground floor", looking down on the ancient street. The museum was built to house everything excavated on the Acropolis Hill and in the cult caves on its slopes. It's arrangement over three floors matches the march of history from the prehistoric period to the Romans. The Parthenon, atop the Acropolis Hill, looks down on the Parthenon Gallery, built to house the marbles from its frieze. The only replicas in the museum are here, emphasizing that the real marbles, also known as the Elgin Marbles, are not here but in the British Museum in London. 6 p.m.: Have a wander in Plaka. Sooner or later, most visitors head there only to be disappointed by how touristy it is, with its seemingly endless souvenir shops all selling the same things. But finding the treasures in Athens oldest continuously inhabited area is worth a little effort. Plaka wraps around the base of the Acropolis on the north and east sides, a maze of narrow streets lined with wooden houses. Look for the photo opportunities of pastel-colored houses draped in bougainvillea, interesting Greek design shops like Forget Me Not at 100 Adrianou and casual tavernas in shady squares. Most of the shops in Plaka stay open until at least 8 pm — some to 10 pm — so you have plenty of time to explore. Take a break at one for a cappuccino freddo, a cold cappuccino topped with frothy cold milk or a frappé, an old-fashioned Athenian favorite made with instant coffee, ice and condensed milk. Once you're refreshed, hunt for Anafiotika, a magical "island" neighborhood hidden against the slopes of the Acropolis. It was created in the 19th century by settlers from the island of Anafi, and once you've found it, you will believe you've been transported to an island in the Cyclades. Its boxy little, whitewashed houses, with blue painted shutters and pots of geraniums, are arranged along narrow lanes that end abruptly and staircases that lead nowhere, spreading up the northeast corner of the Acropolis. To find it, head up Erechtheos Street, toward Pritania Street, turn right and across from the church called Metochi Panagio Tafou, look for ways to go uphill. You'll see lots of signs for dead ends and cul-de-sacs that look like private roads as well as twisting staircases that look private too. They aren't. These are the lanes and streets of Anafiotika. Explore and enjoy the views. 8-8:30 a.m.: If you are in Athens for the first or the fifteenth time, a visit to the Acropolis is a must. Get an early start to avoid the biggest crowds and the heat of the day. Wear sturdy shoes and carry at least two bottles of water — once you enter the World Heritage sites, there won't be any place to get a drink before lunch. There's a lot to see. Start your visit with a leisurely climb up the Dionyssiou Areopagitou, a wide pedestrian avenue that winds through the pine woods and the archaeological sites of the south slope of Acropolis Hill. Before the entrance to the sacred precinct, stop first to visit the Ancient Theatre of Dionysus. This is the oldest surviving theater in the world. Built in the 5th century B.C., it was here, before an audience of 17,000, that the plays of Aeschylus, Aristophanes, Euripides and Sophocles were first performed. About 20 rows of the original 60 rows of seats remain as well as the original diamond mosaic on the stage floor. The site opens at 8:30 am. You can buy a multi-day ticket for all the monuments on the Acropolis as well as the Ancient Agora and several other archaeological sites and museums at the ticket office here. It's €30 but there is an enormous range of categories of free or discounted tickets. 9:15 a.m.: Continue upwards and westward toward the entrance to the sacred precinct on top of the of the Acropolis. It's up a wide set of very worn marble stairs and through a gateway known as the Propylaia. It doesn't matter how many pictures of the Parthenon you've seen in books, brochures and postcards — when you walk through those gates and see it for the first time it looks, at once, exactly as you expected and so much better than you ever imagined. Give in and take the same pictures that everyone else is taking, it is a transcendent experience. The Temple of Athina Nike (also known as Wingless Victory), built to celebrate a victory against the Persians. The Erechtheion, famous for the six maidens supporting its roof — the Caryatids (these are copies; five of the originals are stars of the Acropolis Museum, the sixth is in the British Museum). This was built on the holiest site on the Acropolis. It was here that Athena planted an olive tree, her sacred symbol. According to legend, Persian invaders destroyed the tree; it miraculously sprouted again when they were expelled. Before you leave the sacred rock, take some time to enjoy the 360-degree views of Athens, its thousands of whitewashed houses splashing like seafoam over the landscape and its steep hills. 10 a.m.: Leave the Acropolis the way you entered and turn right in front of the main ticket kiosk, continuing downhill on the eastern slope into the Ancient Agora of Athens. There are restrooms near the main ticket kiosk, and now would probably be a good time to take advantage of them. The gift shop, also near the kiosk, has some nice merchandise inspired by artifacts excavated from the site. On the way down, the rocky hill ending in a steep ledge to your left is Areopagus Hill, site of the world's oldest law courts. It's mentioned in the Greek tragedy, the Oresteia, as the place where Orestes was tried for the murder of his mother and her lover. The Apostle Paul addressed the Athenians there in 51AD and a bronze plaque at the bottom of the hill commemorates his sermons. The Ancient Agora is a quiet, green space overlooked by the Temple of Hephaistos, said to be the best-preserved temple of ancient Greece. There are several lovely shaded paths down through the agora from the temple to the Stoa of Attalos. This two-story building with its columned portico and tile roof was a sort of antique shopping mall, circa 159-138BC with 21 shops on each floor. The current building was reconstructed from existing ruins by the American School of Classical Studies at Athens in the 1950s. The small museum inside has materials excavated in the Agora, including ostraca, the inscribed clay potsherds used to vote in the world's first democracy. 12 noon: By now you must be ready for a break and a quick drink. Leave the Ancient Agora onto Adrianou Street, near the Stoa of Attalos. You're now in Monastiraki, near Athens's most colorful market. The street is lined with tavernas, any one of which can supply you with a quick refreshment. 12:30 p.m.: Make your way to Avissinias Square. It's the center of Monastiraki's antiques market. You'll find it between Ermou and Adrianou Streets, between the intersections of Agiou Filippou and Platia Avissinias. There's excellent browsing for traditional furniture and European bric-a-brac. It's also the location of a great place for lunch — Café Avissinias. It's a bistro with a bohemian vibe, furnished with antiques, mismatched tiles, dark wood. The food is Greek, specializing in mezes with Asian and Balkan influences. It's tiny and popular so book ahead. 2 p.m.: Shop 'til you drop or browse to your heart's content in the seemingly endless warren of interconnecting lanes and paths that make up Monastiraki Market, the Athens flea market. Here you can buy, clothes, food, sweets and baked goods, beads and jewelry, antiques, furniture, ceramics, souvenirs, musical instruments, handmade sandals, textiles, candles, soaps — pretty much everything imaginable. The market's shops, stalls and stands are sheltered beneath awnings that reach across the narrow lanes, almost touching in the middle. Their goods pour out onto the streets. Tourists and Athenians mingle equally here and you never know what you will find. Even if you hate shopping, the people watching and photo opportunities are superb. 5 p.m.: Now, do as the Greeks do, and get ready for a late night with an afternoon/early evening siesta. 7:30 p.m.: The evening starts with drinks and mezethes to stave off hunger pangs while you watch the sunset from a rooftop bar. You could choose traditional Greek drinks such as sweet, resin flavored mastika; ouzo, flavored with anise; or tsipouro, a strong brandy. But why not save the strong drinks for later. Cocktails have recently become fashionable in Athens, and there are some great rooftop bars where the views of the city at night are splendid. Drinks at the GB Roof Garden Bar, on the 8th floor of the swish Hotel Grande Bretagne in Syntagma Square, may be on the pricey side, but to see the Acropolis light up as the sun sinks behind it is worth paying a little more for a drink. From the Galaxy Bar on the 13th floor of the Athens Hilton, you can enjoy a view that takes in Lycabettus Hill and the Acropolis and stretches all the way to the port of Piraeus. 9 p.m.: Gazi is Athens's hip new arts and nightlife district. It was once Athens's gasworks complete with industrial storage tanks, gasholder, pipeworks, lights and towers. And it was the only gasworks in Europe undamaged by Nazi bombs; they had a soft spot for the Parthenon, less than a kilometer away, and wanted to spare it. It was abandoned as a gasworks in the 1980s. Regeneration began in the 1990s with the creation of Technopolis City of Athens. It's a multi-purpose, design, art and music venue, and museum that, with its abandoned gasholder and massive, red floodlit chimneys, is a focal point of the neighborhood. Today, Gazi is a buzzing hive of restaurants, bars, dance and live music clubs that come to life when the sun goes down and heaves with people — Athenians, tourists, old and young (though it's not particularly family friendly). Try the streets around the main square and Kerameiko Metro Station — Iakou, Persefonis, Dekeleon, Triptolemou and Voutadon — for the best cafés and bars. The Butcher & Sardelles is actually a pair of popular restaurants, side by side and owned by the same team. One is renowned for its grilled meats, the other for fish. You can try to book, but your best bet is to get there before the main dinner crowd arrives at 10 pm. After dinner, keep the night going at the arty music café, Hoxton, with live music at Gazarte, or with a techno rave vibe at PIXI. 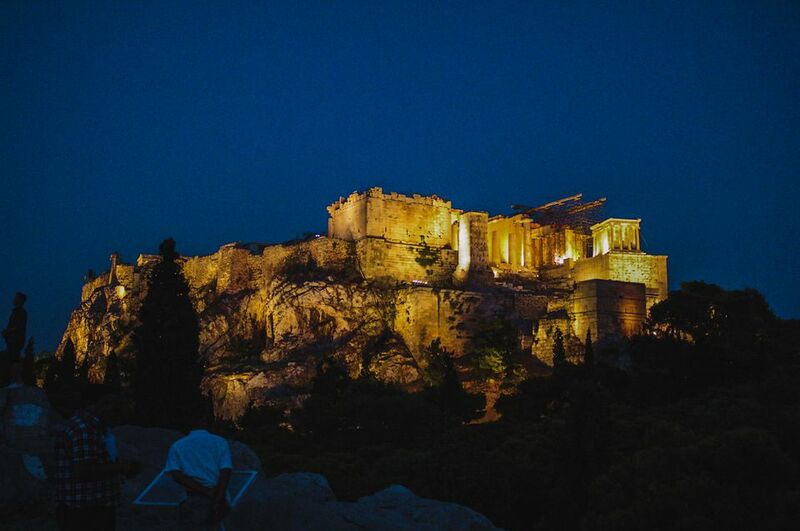 If a Wild Night Out is Not Your Scene... go for a dinner surrounded by the best view in Athens instead. Orizontes Lycabettus is at the top of the rocky outcrop called Lycabettus Hill. (only the church is higher). You reach it by funicular cable car. The menu is modern Greek, leaning heavily, but not exclusively, toward seafood. But the real knockout draw of this place is the view of all of Athens spreading out below it. Booking is essential, and be sure to ask for a table near the edge of the terrace. There are also, vases and small metalwork objects as well as objects from Egyptian and Cypriot antiquities. 11:30 a.m.: Spend some time browsing the Museum Shop. It's stuffed with high-quality reproductions, artwork and sculpture, endorsed by the Greek Ministry of Culture, as well as less expensive books, prints, postcards, and small gift items. You can treat yourself with the money you've saved by not buying tacky souvenirs in Plaka. 12 noon: There are two garden cafes in the archaeology museum, one in an internal courtyard, the other in an outdoor garden. Both are of the basic sandwiches, cakes and drinks variety. Still, sitting in the shade of palms and fig trees, while statues peer out from under the greenery is very pleasant. Have a glass of wine here before heading in search of lunch. This is not a particularly inspiring neighborhood for food. Your best bet is to get back on the Metro at Omonia for the 4 minute trip on the Red Line (M2) to Acropolis Station. 1 p.m.: The Acropolis Museum has a highly regarded, indoor and open-air restaurant on the second floor where you can get a last lingering look at the Parthenon. Access through the museum for restaurant-goers requires a free ticket from the admissions desk.